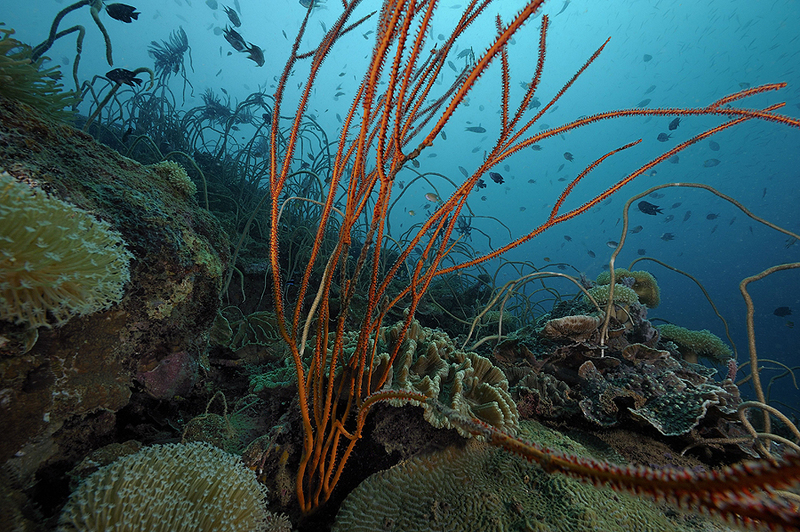 Papua New Guinea’s marine life is as rich as the life found in its forests. The island lies at the heart of the Coral Triangle, the world’s most bio-diverse marine environment. 76% of the world’s reef-building coral species inhabit this area, which stretches from the Philippines to Indonesia. A single hectare of the Coral Triangle may contain more coral than can be found in the whole of the Caribbean, or even the entire Atlantic Ocean. These corals constitute prime habitats for many marine species, many of which remain unknown. Surprisingly, despite this abundance, the majority of research on marine biodiversity has been carried out on regions that lie outside the Coral Triangle. The two countries that discovered the highest number of new marine species between 2001 and 2010 were Australia and Japan, both of which are home to far fewer species. The reason for this is that although Japanese and Australian marine ecosystems are less diverse than those of countries based in the Coral Triangle, these two countries have a higher number of research programmes and academic institutions. This new ‘Planet Reviewed’ expedition will collect a great deal of data, to complete our knowledge of the extremely abundant biodiversity present in this area, which has not yet been properly studied. The expedition will also provide an opportunity to compare various different research methods. The results of this research will be used to try to answer the question naturalists have been faced with for almost 200 years: how many living species inhabit our planet? Madang - Papouasie-Nouvelle-Guinée - Fond caractéristique sur les pentes externes du lagon de Madang. On y trouve une grande variété de coraux, gorgones, alcyonaires en bonne santé [© Xavier Desmier / MNHN / PNI / IRD]. Each year, between 1,600 and 1,700 marine species are discovered, these are added to the 235,000 that have already been recorded. Half of these are molluscs and crustaceans, nevertheless most research programmes and conservation initiatives are focused on larger ocean creatures (turtles, marine mammals, fish, reef-building corals, etc), which represent just 8% of marine biodiversity. One of the reasons for this is the ‘charisma’ of larger animals; it is easier to generate public interest and raise funds to protect marine turtles or whales and dolphins than it is to study benthic micro gastropods. Larger fauna is also easier to study than micro fauna, particularly in areas as rich in biodiversity as the Coral Triangle. Indeed, in complex ecosystems, species are generally small and rare and as a result, the number of samples collected during an expedition is usually huge, which means a great deal of work for taxonomists sorting and then analysing data. Such studies cannot always be completed, as however comprehensive the sample taken, species are often represented by only one or two specimens, which is not always sufficient to determine their novelty. Unfortunately, a lack of expertise is often the ultimate handicap; for some rare groups there is simply no specialist. When this is the case, specimens are added to museum collections to wait for the day that somebody will come and study them. To overcome some of these difficulties a change of scale is required, by collecting massive inventories and by bringing together experts from around the world, as was the case in Panglao in the Philippines (in 2004) on the island of Espiritu Santo, in Vanuatu (in 2006), or in the south of Madagascar (in 2010). This type of deployment provides excellent results: in Panglao over 7 weeks of work in a 15,000 hectare area, 1,600 species of decapod crustaceans (crabs, shrimp, etc) and between 5,000 and 6,000 species of molluscs were collected, among which several hundred were previously unknown. In comparison, all 800 million hectares of European seas combined are home to just 672 species of decapod crustaceans and 3,450 species of molluscs. Madang - Papouasie-Nouvelle-Guinée - Collecte d'échantillons d'algues sur la zone infralittorale du lagon de Madang [© Xavier Desmier / MNHN / PNI / IRD]. Each new expedition in the Coral Triangle is an opportunity to discover unknown species, and this one will be no exception. According to estimates, around 30% of benthic invertebrates collected will likely belong to new species. Numerous habitats, which until now have been little explored, such as marine lakes in the vicinity of Madang, as well as submerged forests, will be explored. Particular attention will be paid to interactions between invertebrates, whether these are parasitism, commensalism or other types of association. Rapid biodiversity assessments will be carried out based on groups of indicator organisms (fish, coral, mangroves, etc), this is common practice among conservation biologists. The data obtained from this work will be fed into international databases on tropical organisms. At present, very little is known about species living in the depths of these regions, the marine expedition will therefore be of great interest. Thanks to GPS technology, highly accurate maps of coral reef habitats will be produced in the months following the expedition and will be made available to the scientific community and conservation organisations, policy makers and other parties interested in this type of tool. The specimens collected will enrich the collections of The University of Papua New Guinea, the National Museum of Natural History and the IRD (L'Institut de recherche pour le développement). Finally, numerous scientific articles (probably running into the hundreds!) will be published in the years following the expedition, in areas as diverse as the description of flora and fauna, the evaluation of working methodologies and the protection of species, among others. This knowledge will also be simplified and disseminated in order to build as much awareness as possible of environmental issues. As part of this, as was the case for the Santo 2006 expedition, a book on marine life in the Bismarck Sea will be published few years after the end of the expedition. 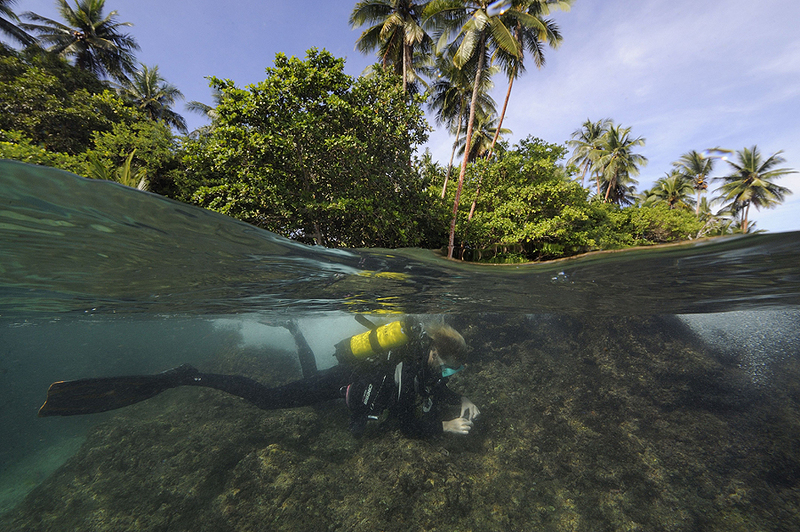 Although it is not an impact study, data on marine habitats reported by the expedition may also be used as a departure point to evaluate the consequences of industrial projects planned in the Madang Province and in the Astrolabe Bay. These projects include the construction of the Madang Marine Industrial Park, which will include a fish processing plant in the north of the lagoon, and two projects led by offshore mining companies.